One of the Northwest Territories’ oldest companies, Northern Transportation Company Limited (NTCL), began as an offshoot of the radium and uranium mining on Great Bear Lake (map). 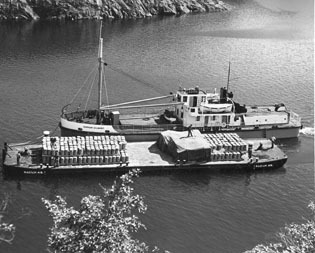 In 1934 White Eagle Mines, on the east shore of Great Bear Lake, purchased the assets – one tug and two wooden barges – of a small transport company called Northern Waterways Limited. White Eagle changed the name of this company to Northern Transportation Company Limited and used the tug and barges primarily to serve its mine on Great Bear Lake. Eldorado Gold Mines Limited, also operating on Great Bear Lake, acquired NTCL in 1936 and began operating it as a common carrier. NTCL competed against the largest shipping company in the north, Mackenzie River Transport, a branch of the Hudson’s Bay Company. In 1937 NTCL brought in the first steel hulled vessels to operate on northern rivers and lakes. The Radium King operated below the Slave River rapids on the Slave River, Great Slave Lake, Mackenzie River and Great Bear Lake while the Radium Queen operated on the upper Slave River, Lake Athabasca and on the Athabasca River below Fort McMurray. The closure of Eldorado Mine in 1940 put the future of NTCL in doubt, at least until 1942 and the beginning of the CANOL Project. This project – the construction of a pipeline, road and telephone line from Norman Wells to Whitehorse, Yukon – dramatically increased the tonnage shipped by NTCL. In 1944 the Federal Government evoked the War Measures Act and expropriated both Eldorado Mine and NTCL. Eldorado, which began as a radium mine, became a uranium mine and a key part of the Manhattan Project and the development of the atomic bomb. NTCL was the principle means by which low grade uranium ore was shipped south. NTCL acquired Mackenzie River Transport from the Hudson’s Bay Company in 1947, participated in the construction of the DEW Line in the 1950's, and the development of the oil fields on the North Slope of Alaska in the 1960's and 70's. In 1985 the Federal Government sold the company, as part of the land claim settlement, to the Inuvialuit Development Corporation and Nunasi Corporation. The second freighter, the Radium Gilbert, on Great Bear Lake was still in use in 1963 when this photo was taken. The barge being towed apparently ran aground in the 1980's at Deline.